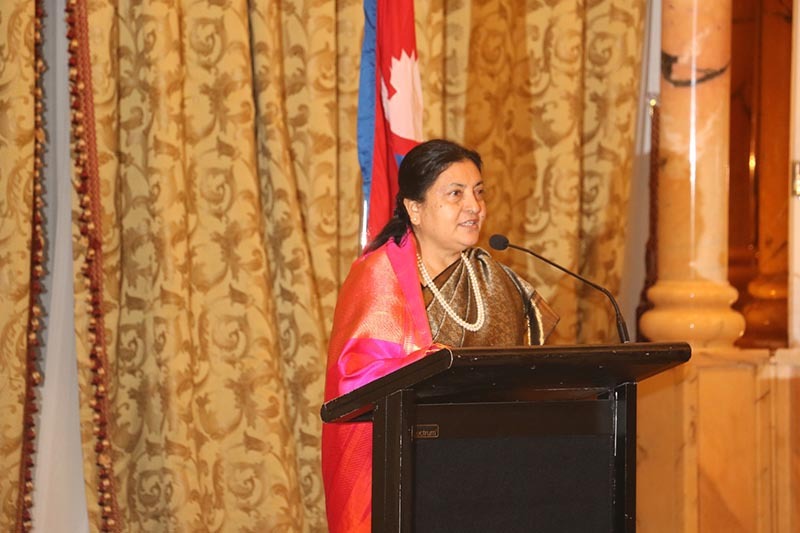 KATHMANDU, Dec. 5: President Bidya Devi Bhandari has said that support and cooperation of all was essential for the protection and promotion of the Newa culture, which remains as the unique cultural identity of Kathmandu valley. Speaking at the 14th National Jyapu Day celebration organised by the Jyapu Culture Development Trust, she lauded the Jyapu community for their dedication in preserving the distinct culture of Nepal. “Support and good will of all is essential to preserve the art, culture and language of the Jyapu community, who are very rich in art and culture,” she said. She also expressed the confidence that the Newar and specially the Jyapu community would be successful in the campaign of reconstructing and reinstalling the culture heritage of Kathmandu that was damaged in the 2015 earthquake. “There are apprehensions that modernisation has put a shadow over the unique art and culture of Nepal,” the President said while urging all the stakeholders to leave no stone unturned in preserving and promoting the very precious art, culture, traditions and customs of the country. At the event, mayor of Kathmandu Metropolitan City Bidya Sundar Shakya shared that the metropolis has launched a campaign to conserve art, culture and language of the valley. Nepali Congress leader Tirtharam Dangol recognised Newar community as rich in agriculture, art and culture. On the occasion, President Bhandari conferred the ‘Jyapu Ratna Award’ on sculptor Rabindra Jyapu, while Phanindra Ratna Bajracharya and Natikaji Maharjan were honoured with the ‘language and culture award’, and the ‘education award’ respectively.